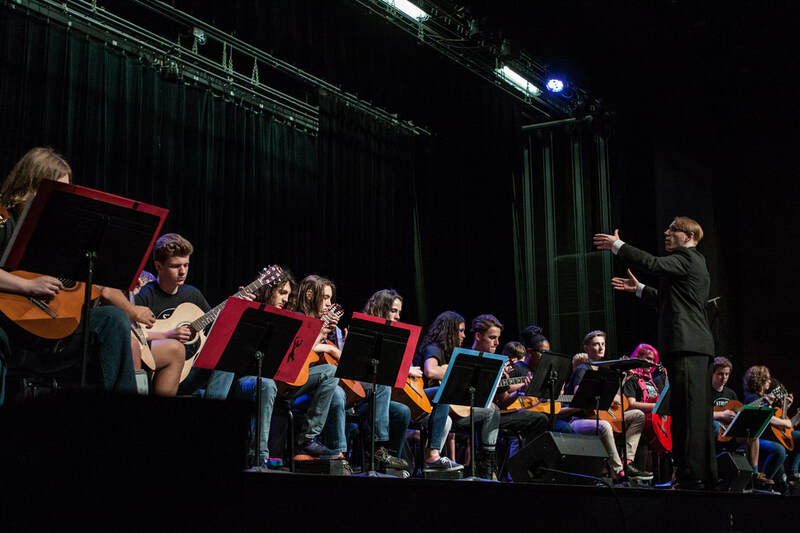 Welcome to the official website for Field Community School's CHOIR and GUITAR program! For specific class information, please click the links above and to the right of the "HOME" tab. **Don't forget to scroll down this page to read the most recent updates. **​At the very bottom of this page you'll find some general dates and downloads. The current specialist newsletter should be arriving in your email inboxes by the end of the day. Based on poor registration numbers, the STRUT: GUITAR FESTIVAL directors and planning team unanimously decided over the weekend to cancel all remaining events for the current academic year, including the Battle of the Bands that was scheduled to take place on Feb. 23rd and the Guitar Orchestra Concert that was scheduled for April 27th. Going forward our plan is to regroup at a later date with the intention of bringing STRUT back in the future. Small group/Guitar/Music X performances will occur in between, before, &/or after the choir performances, to be announced ASAP in a separate communication. 1. The work shifts are labelled by class to help reduce performances conflicting with work times. Please look to see when you child is performing to make sure it's not during the shift you intend to sign them up for. 2. Parents signing up online for their child need to input their child's name as the "Volunteer Name". The October Specialist Newsletter (email) went out last week, including some important updates. If you did not receive that email, please contact the Field office to get added to that email list ASAP. Registration forms for all of my classes are PAST DUE, which included information about the music shirt order, concert performance dates, donations, volunteering, and updating your contact info with me directly. I will be sending out an email to all parents who have indicated an interest in volunteering as there are events coming up throughout the year. Please review the concert dates listed on the choir, guitar, and/or music explorations pages of this website. The home concerts at Field (Nov. 16th for choirs, Jan. 14th for guitar/mus x) are required for a grade. Any students who are unable to attend/perform will need to make up those lost points using the extra credit "CONCERT REPORT" assignment which is downloadable at the bottom of this homepage as well as the individual class pages. I have also included a list of ideal concert report performances that can be downloaded at the bottom of this page as well. This week we have a special guest visiting in MADRIGALS and CHORALE. His name is Pablo Mendoza, and he is a composer originally from Columbia who has been working and studying in Mexico for his doctorate in musicology. He has been selected as the composer in residence for the 2018-2019 VOCALESSENCE CANTARÉ program that our two auditioned choirs have been honored to participate in this year. This is the first of 3 residencies we'll be hosting him in preparation for a special end of the school year concert at the Ordway in downtown St. Paul on Tuesday, May 21st. Madrigals and Chorale will be premiering brand new compositions that Pablo will be writing just for them based on his experiences in our classrooms. This week also marks the announcement of the small group rosters in my Music Explorations class. I spent a considerable amount of class time gathering information about students individual musical interests and preferences for small group members, as well as teaching brief "crash course" units on each of the major instruments that we have available for student use in the classroom (Vocals, Percussion, Ukulele, Guitar, Bass, Piano) and having students create lyric/chord sheets for 3 songs to present to their small group. Thursday, March 28th, 2019 ................ Last day of Quarter 3 grading period.